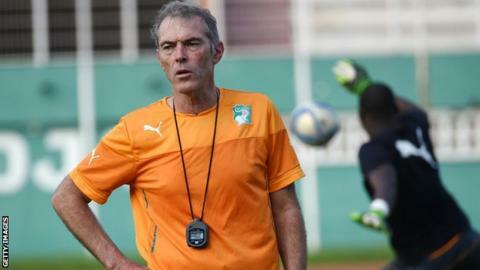 Ivory Coast beat Cameroon 3-0 after extra-time in their African Nations Championship quarter-final in Rwanda. The first 90 minutes of the game produced very little in the way of quality football and ended goalless. Koffi Boua, Atcho Djobo and Serge N'Guessan scored the goals for coach Michel Dussuyer's (pictured) side. The Ivorians will now play the winners of Sunday's Tunisia against Mali quarter-final in Thursday's semi-final. Boua headed in a cross from Krahire Zakri five minutes into extra-time. The second was also a header this time from Djobo as he connected with a corner taken by captain Serge N'Guessan on 102 minutes. The third goal was a spectacular strike from N'Guessan, who shot from just over the half-way line in the 112th minute, having spotted the keeper off his line.